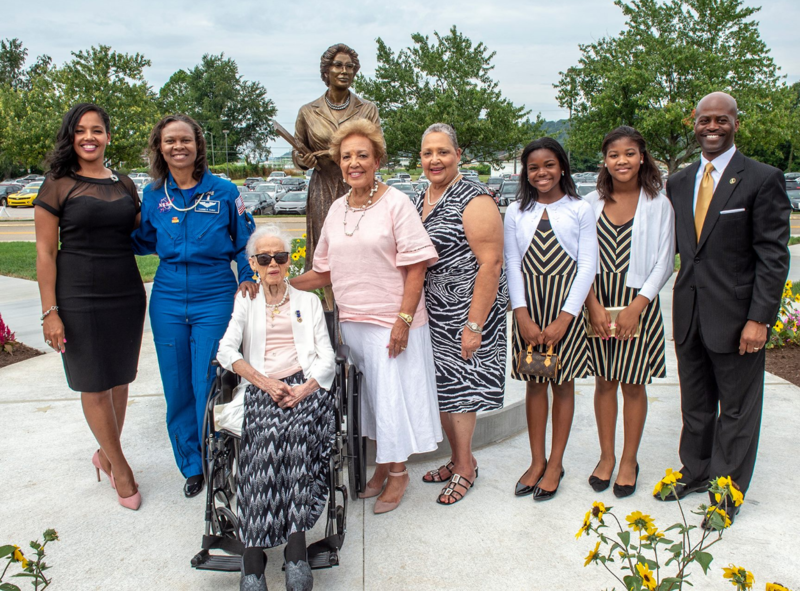 On August 25, 2018, West Virginia State University was proud to honor distinguished NASA mathematician and WVSU alumna Katherine Johnson (Class of 1937) with the establishment of the Katherine Coleman Goble Johnson Scholarship and the unveiling of a beautiful bronze statue in a newly created plaza adjacent to the quad.More than 300 individuals and organizations contributed to this effort, and the names of those who gave $1,000 or more are forever inscribed on a plaque near the statue.As efforts continue to increase the endowed scholarship and enhance the plaza surrounding the statue, gifts of all sizes are welcome and appreciated. Two new naming recognition opportunities are available for those who give at the Moon or Galaxy level before April 30, 2019. 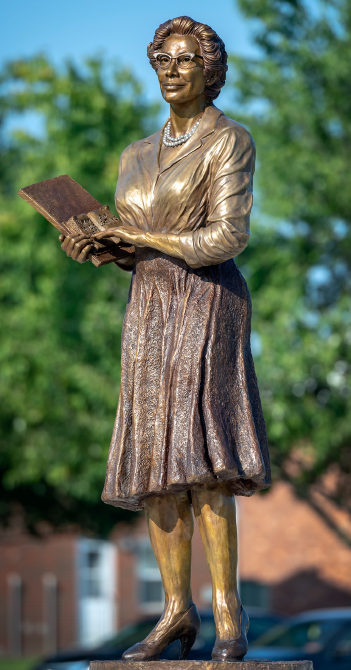 A life-sized bronze statue created by West Virginia sculptor and WVSU alumnus Frederick Hightower now stands on the WVSU campus as a source of inspiration to current and future students of all that is possible through dedication, hard work and perseverance. Building upon Katherine Johnson’s legacy as a pioneer in mathematics and WVSU’s strong track record of education in the sciences, the Katherine Coleman Goble Johnson Scholarship benefits students majoring in STEM fields, with emphasis on assisting talented individuals who are underrepresented in those fields. All future gifts will increase the funds available to support students. Benches will be placed around the statue to provide seating and a comfortable place to reflect on Katherine Johnson’s remarkable legacy. A gift of $5,000 will be recognized with the naming of a bench. All proceeds above the cost of the bench will be contributed to the Katherine Coleman Goble Johnson Scholarship. A limited number of benches are available. Attractive brick pavers will be placed along the sidewalks leading up to the statue from all directions. A gift of $1,000 will be recognized with the naming of a brick. All proceeds above the cost of the brick will be contributed to the Katherine Coleman Goble Johnson Scholarship. A native of White Sulphur Springs, W.Va., Katherine graduated from West Virginia State in 1937 at the age of 18, with bachelor’s degrees in mathematics and French. Her pioneering work as a “computer” at NASA has been widely recognized following publication of the book, Hidden Figures, by Margot Lee Shetterly, and by the movie of the same name. In 2015, she received the Presidential Medal of Freedom, the highest award that can be bestowed upon a civilian.